Montgomery Modern tours offer a chance for firsthand experience of the county’s mid-century modern architecture. Explore guidebooks from previous tours below. The 2017 tour explored the Montgomery County work of Cohen, Haft & Associates, a leading modernist architecture firm in the Washington, DC area, distinguished for designs integrated with their natural settings, including Sumner Village, Whitehall Apartments, B’nai Israel and Paint Branch Unitarian Church. Founded in 1958 by architects Jack Cohen and Leonard Haft–and later known as Cohen and Haft, Holtz, Kerxton, Karabekir & Associates –the award-winning firm designed more than 200,000 housing units within the region during an 18-year period. 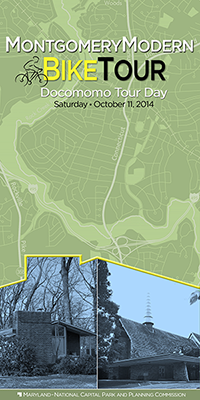 Stops included Potowmack Preserve, The Hilltop, and the Bender JCC. Montgomery Modern Bus Tour 2017 from Historic Preservation – Montgomery County Planning Department on Vimeo. 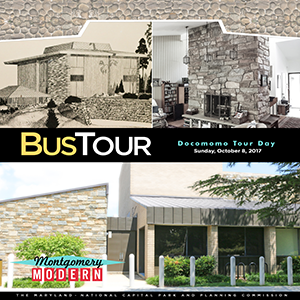 This bus tour explored the Montgomery County work of Deigert and Yerkes, a leading modernist architecture firm in the Washington, DC area, best known for the National Arboretum Administration Building. Operating from 1947 to 1967, the partnership of Robert Campbell Deigert and David Norton Yerkes, created distinctive designs with variety in materials and textures, surprising angles, and contrasting spaces. Led by Montgomery Modern author Clare Lise Kelly, the tour included the rustic modern houses of Tulip Hill (1950-55) and Oak Spring (1966), lunch at Primary Day School (1955), and a concluding reception at Pietro Belluschi’s Cedar Lane Unitarian Church (1958). Presented by the Montgomery County Planning Department, the tour was offered in partnership with Docomomo-DC and AIA-Potomac Valley. 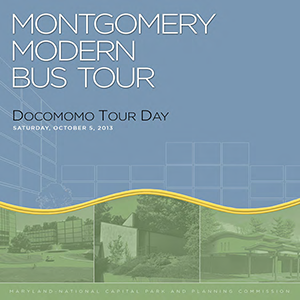 Montgomery Modern Bus Tour 2016 from Historic Preservation – Montgomery County Planning Department on Vimeo. On October 11, 2014, Montgomery Planning’s Historic Preservation Office invited the community to pedal around mid-century neighborhoods and landmarks and learn more about Montgomery Modern. 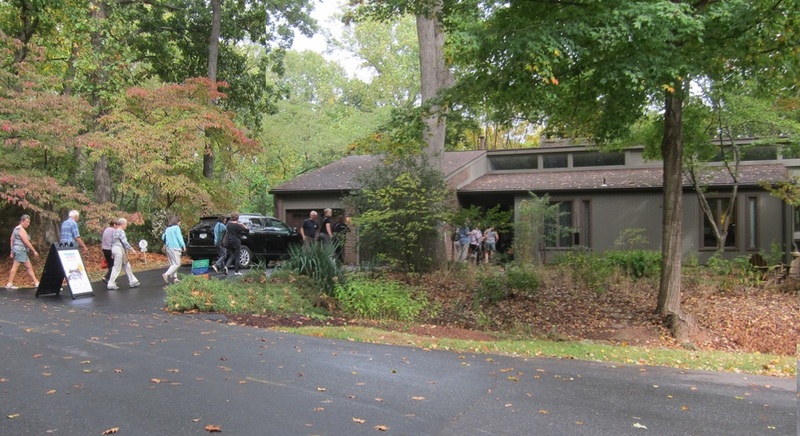 This tour provided an opportunity to experience firsthand some outstanding examples of mid-century modern architecture in Montgomery County, Maryland. Featured are a range of projects that include residential neighborhoods, a custom home, community buildings, and corporate headquarters by nationally known architects and accomplished local practitioners. 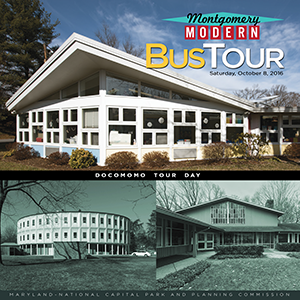 The October 5 bus tour was a program of the Historic Preservation Office’s Montgomery Modern initiative in partnership with the AIA Potomac Valley Chapter, a Docomomo Tour Day event.